1ST YEAR 1932 COLT GOVERNMENT MODEL NATIONAL MATCH 1911-A1 OR 1911A1 MODEL .45ACP CAMP PERRY MATCH STYLE PISTOL. COLT 1911 COMMERCIAL (1917 MFG.) .45ACP ALL CORRECT AND IN 96 TO 97% ORIGINAL CONDITION W/ HOLSTER. 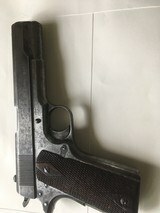 Colt Model 1911 45 ACP Commercial Model Pistol manufactured in 1917.